In July we took out granddaughter to New York City. 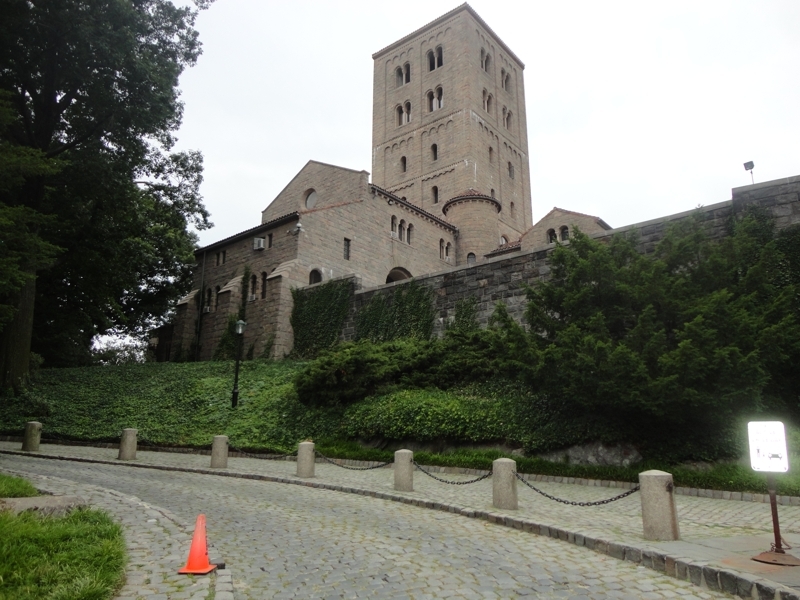 Day one we went to the Medieval art museum, the Cloisters, on the northern tip of Manhattan. I’ve traveled the NYC subway system before, but this trip was unusual. Our train stopped, everyone was told to get off, and we were left to find our own way. A friendly New Yorker led us one level down to 1 Train. (Definitely not your Times Square station type of stop; kind of scary.) Anyhow, after a taxi ride and a walk through the park surrounding the museum we arrived. The Cloisters, besides housing some wonderful sculpture, tapestry, and painted art, plus The Belles Heures of Jean de France, Duc de Berry, a handmade and painted prayer book (heaven for a calligrapher to view), has an herb garden typical to the times (13-15th centuries AD). I’m wandering through the beds seeing how many of the plants I grow, when I come across… a weed! Plantain! Growing in the immaculate beds of the Cloisters. 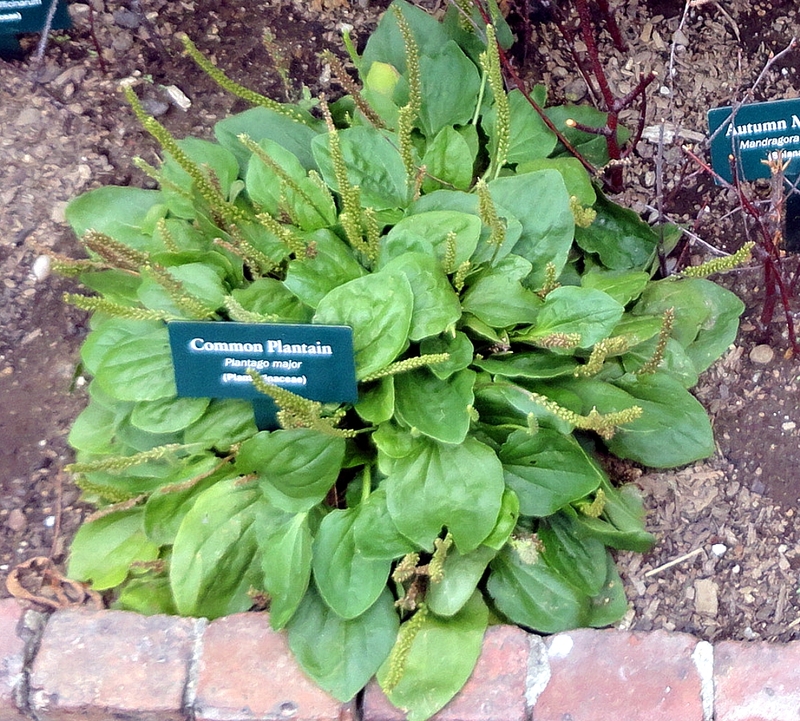 Plantain in the Cloisters’ herb bed. I had to get close just to make sure. So the plantain growing in my driveway is another useful weed brought by colonists? Seems so &mdash; Plantago major, a common, pervasive weed. On returning home I checked out my copy of Pamela Jones Just Weeds (you’d think I’d have known this information already from perusing this book) and there it was listed, a plant that literally followed the footsteps of the Roman army, although she admits the boundaries between fact and fiction about this plant are blurred. 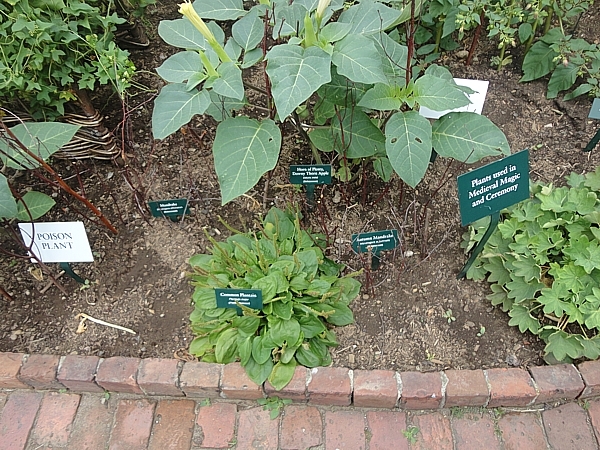 According to Jones’ entry: ‘Leaves, roots, and seeds of plantain, fresh or dried, have been used for centuries in the treatment of such varied ailments as poison wounds, asthma, dysentery, earache, and kidney disorders. Rich in potassium salts, plantain is regarded as one of the finest remedies for cuts, abrasions, infections, ulcerations and chronic problems of the skin.’ According to her it can even heal other plants — she tried it on a fruit tree with blight and it worked! Plantain is also edible. The new leaves can be used like spinach. Older ones are tough. Plantain contains healthy amounts of Vitamin A, C, calcium, and iron. I’m trying out a recipe for a skin salve, too, since claims make it sound like a panacea for skin injuries and disorders. Food and medical recipes can be found all over the internet. Guess I just wasn’t looking!